Divide self-raising flour between 2 bowls. Stir caster sugar into 1 bowl. Stir dark brown sugar into the other. Whisk buttermilk, butter, eggs and mashed bananas in a bowl. Divide between the 2 flour mixtures. Stir to combine. 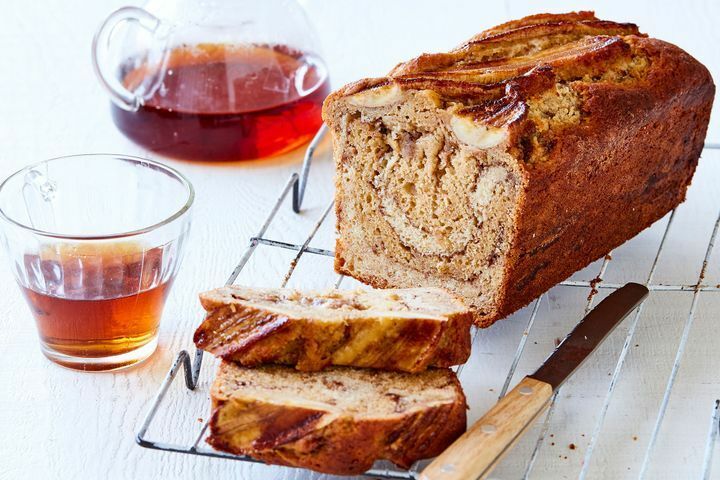 Layer the banana bread mixtures in a greased and lined 10cm x 22cm loaf pan, alternating with cinnamon sugar. Use a knife to gently marble. Smooth the surface. Melt 10g butter in a frying pan over medium-high heat. Halve lady finger bananas lengthways. Cook, cut-side down, for 2 mins or until golden. Arrange, cut-side up, over the banana bread. Bake at 180C for 1 hour or until a skewer inserted in centre comes out clean. Cool in pan for 5 mins. Turn onto a serving Recipes & food preparation plate. Serve warm or at room temperature.